I’ve loved Winnie the Pooh since I was a baby and remember watching it with my Mom all the time. Out of the dozens of rows of cards, this Mother’s Day card caught my eye and I knew I didn’t need to look any further. I stood there grinning as I read it and must have looked like a complete idiot. Yes. 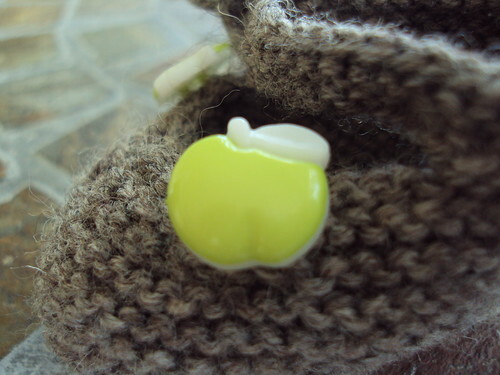 I made another pair of booties. It was the perfect take-a-long project to work on in the car. I tend to get carsick (migraines) if I look out the window too much, so I needed something to focus on for the 2 hour car ride to Grandma’s Easter Dinner. I used the same pattern as last time (see yesterday’s post), but modified the straps by only making one and casting on 15 sts instead of 10. 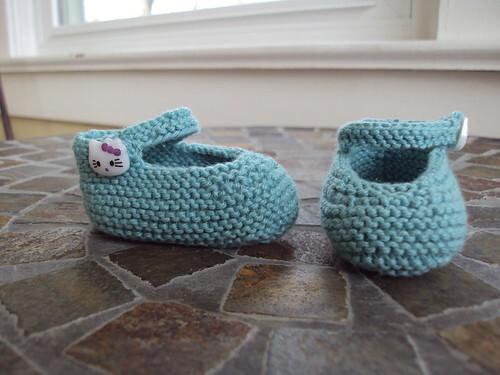 These cotton booties are a lot “mushier” and softer than the wool ones. See my Ravelry project page for more details. I needed a break from quilting. I also needed a project that wouldn’t require spending any money. 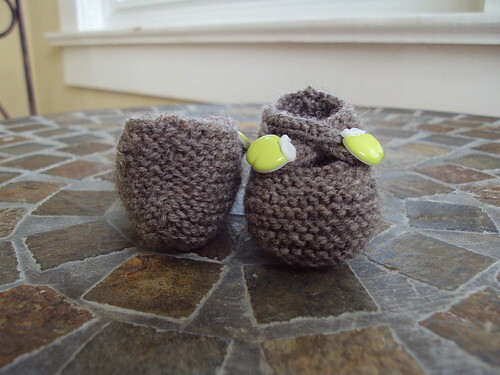 So I made these adorable booties on Friday night. I was finally able to use some of the super cute buttons my friend gave me. These booties are itty bitty… only 3 1/4″ from heel to toe! They worked up quickly and the knitting was done in a couple of hours. The seaming was about another hour, but garter stitch is easy to sew up and you can’t even see the seams. 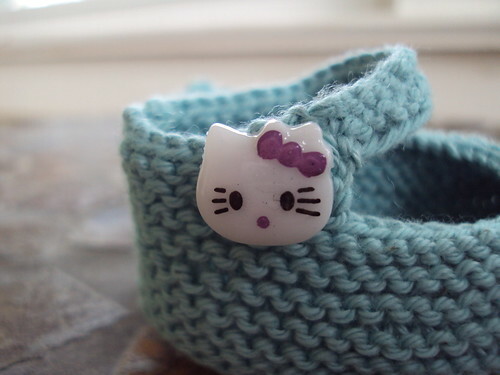 For more photos and details, check out my Ravelry project page. I’m finally getting around to posting a progress picture of my Lone-star quilt. These 13 stars have been finished for 2-3 weeks and I haven’t worked on it since. I'm loving the blue tones and all the stripes! 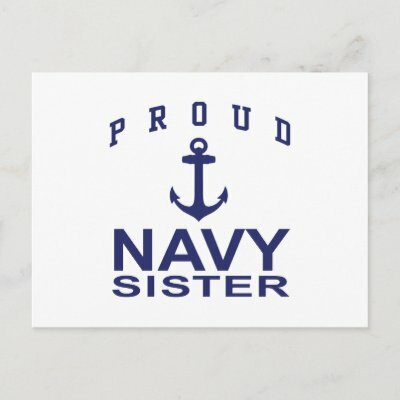 Last month, I found out that since Hubby got his promotion at work, he’ll need to go down to Baltimore for four weeks (FOUR!) for more training (On top of the 6 months of training he’ll be doing at his office). I’m not looking forward to a month by myself… especially since we’ve moved even further away from my family. I’ve decided to hold off working on the Lone-star until then so I’ll have something to keep me occupied. I also have my sights set on tearing down the kitchen wallpaper. Time will tell. 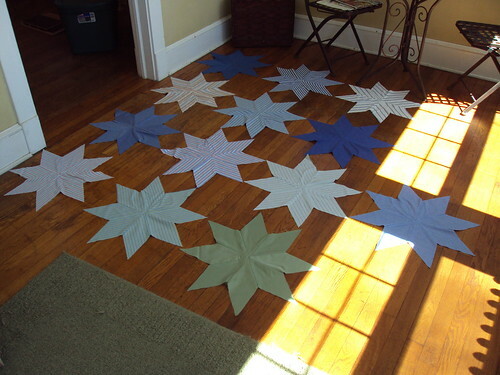 I’m thinking I need at least 7 more stars, but I’d love for the quilt to be even larger than that. Our spare bedroom will have a full-size bed and it would be nice if the quilt could hang down almost to the floor. I’m pretty sure I can get another star out of each buttondown, so that should give me a nicely sized coverlet.